Is there anything more swoon-worthy than a waffle cone dripping with ice cream or a loaded ice cream sundae? I love all flavors of ice cream. You name it, I love it. Well…unless it’s something totally weird like foie gras ice cream or lobster ice cream. (Yes, those really exist.) But any downright ghastly flavors aside, I love them all. And there is only one thing better than eating your favorite ice cream and that’s finding your favorite ice cream on sale for 50% off! Thanks to New Seasons Market, that’s exactly what’s happening and I’ve been stocking up. 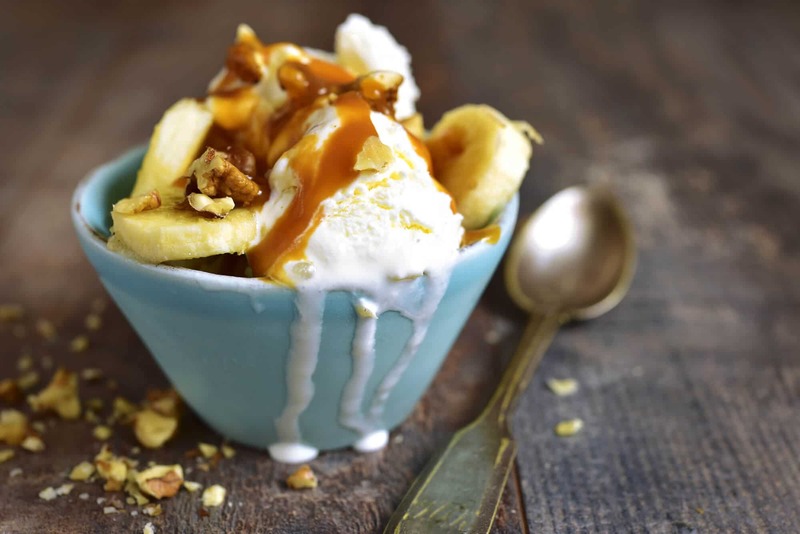 In celebration of ice cream, one of the world’s greatest inventions, I’m sharing a delicious caramel sauce with you that pairs beautifully with a variety of ice cream flavors. It’s the ice cream topping my kids request the most – it’s easy to make and simply irresistible! None of that nasty corn syrup stuff – just pure butter, cane sugar and cream. And as if you need an excuse to eat it, here are a few more ways to put this luscious caramel sauce to use: Cinnamon rolls, brownies, apple pie, cheesecake, scones, bread pudding, pancakes and fresh apples slices! 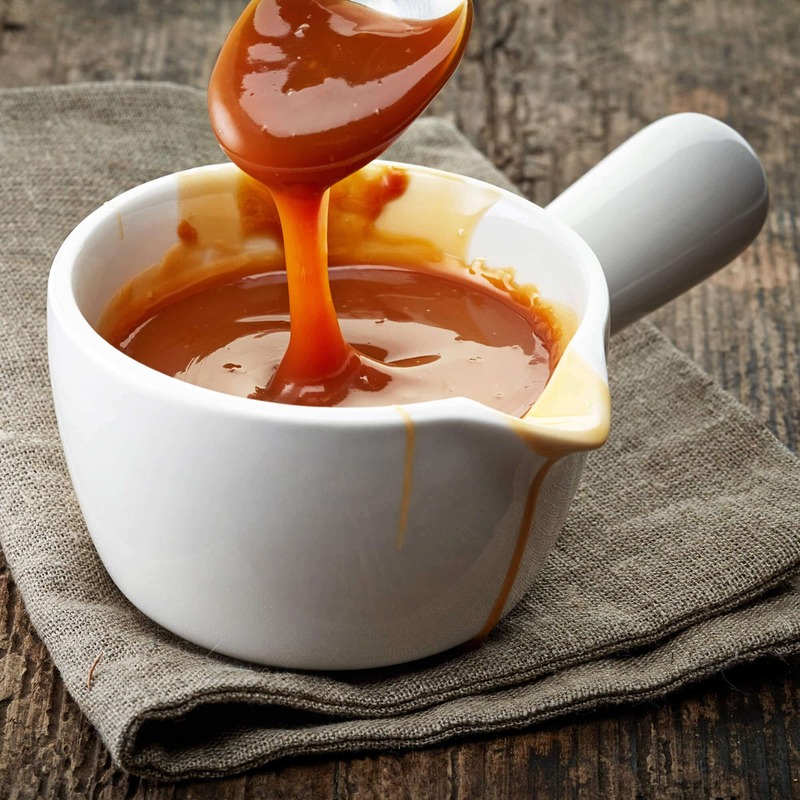 Look no further, this is everything a caramel sauce should be! In a medium saucepan over medium-high heat, combine the sugar and water, stirring to combine. Simmer until the syrup has turned a dark golden color, about 10-12 minutes. A candy thermometer isn't necessary, but it's helpful. 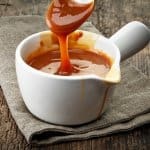 For a thick but pourable sauce your candy thermometer should read about 230 degree F. For a little thinner sauce aim for 225 degrees F.
Once the caramel is ready, whisk in the warm cream and simmer for another couple of minutes. Remove from heat and whisk in the butter, vanilla extract and salt. Serve warm or keep stored in the refrigerator. To reheat it, simply heat it up briefly in the microwave. 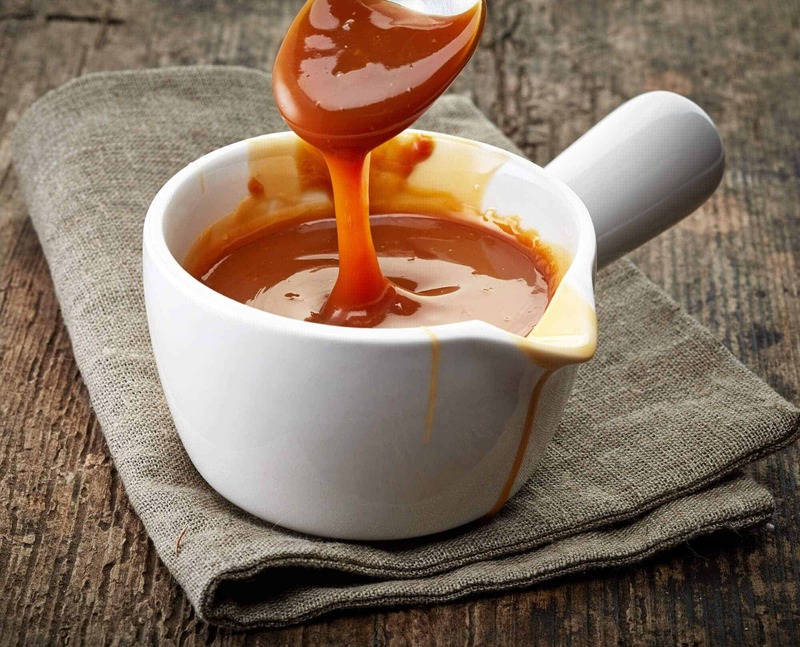 * Want a salted caramel sauce? Simply increase the salt to 3/4 teaspoon. * This caramel sauce can be made in advance and stored in the fridge, covered tightly, for up to 2 weeks. 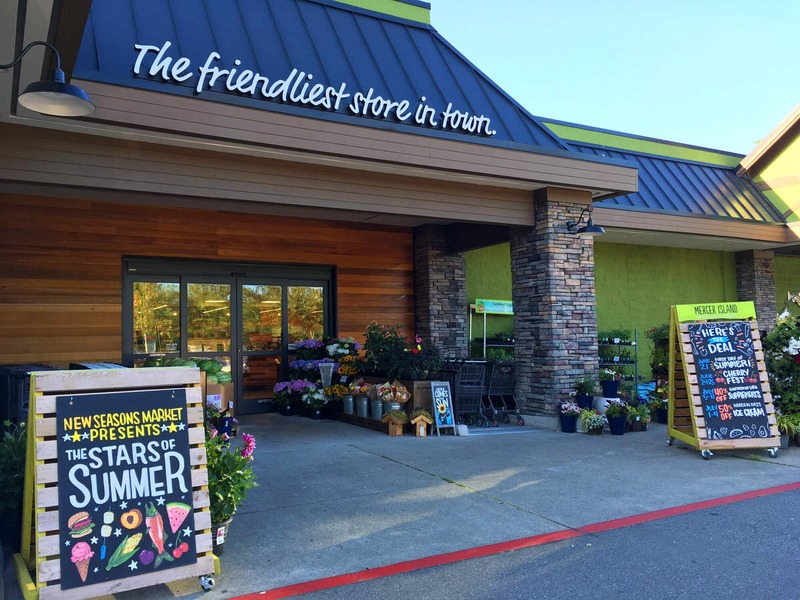 A special thank you to New Seasons Market for sponsoring this post and to my readers for supporting the brands and businesses that help make The Daring Gourmet possible! We moved to an area that doesn’t have a New Seasons and I miss it SO MUCH!! This caramel sauce will be a fun treat to top our ice cream off with this summer, thanks! I’m ready to go get ice cream and make this!! What a great sale on ice cream! I’d say it’s definitely time to stock up! And this caramel sauce would be my topping of choice too! Looks delicious! I want to pour this sauce on EVERYTHING (not just ice cream)! ;) It looks amazing! I have not made caramel in forever. I think I need to make caramel sauce soon. I will drink it if I could. I love caramel sauce on just about everything! This is great to know! There’s a New Seasons market not too far from us. And that caramel sauce looks amazing! This sauce looks so heavenly! We all scream for ice cream!! I need this caramel sauce! I want a big bowl of ice cream with this sauce on top! Some ice cream is better than booze. Especially if it’s dripping with this sauce! Pass that this way and then just leave me alone with it and a spoon please. Would it be bad to just eat the sauce with a spoon?! What’s a valid non-milk substitute for the Cream? My wife is Lactose intolerant, but loves caramel. Hi Mark, you’ll need to let the sauce simmer longer to thicken up and it may not get quite as thick as with cream, but full-fat coconut milk is probably your best bet. I have been remiss in not thanking you yet for this recipe. I’ve made it up several times and it is divine! I’ll be making it up again this weekend to go on an apple crisp. Always turns out well. Thank you, grayslady, I really appreciate the feedback! You know, I’ve never served apple crisp with caramel sauce and the more I think about it the more I realize how remiss I’ve been in not doing so!